News Version 1.0.2 includes option for GPU-based computing. It is still challenging to call rare variants. 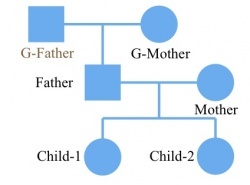 In family-based sequencing studies, information from all family members should be utilized to more accurately identify new germline mutations. FamSeq serves this purpose by providing the probability of an individual carrying a variant given his/her entire family’s raw measurements. FamSeq accommodates de novo mutations and can perform variant calling at chrX. FamSeq takes both likelihood and the widely used vcf files as input. Updated in v1.0.3: Allows for VCF output from FreeBayes. For windows user, please check here to extract the file. First specify the command according to the input file type. If the input file is a VCF file, the command is vcf. If it is a likelihood only format file, the command is LK. The method used in variant calling. It is an integer. 1(default): Bayesian network. It works well when family size is less than seven. 2: Elston-Stewart algorithm. Use this method when family size is larger than 7 and the family has no loop. 3: MCMC. Mutation rate. It is a float. The default value is 1e-7. Only record the position at which the genotype is not RR in the output file. (R: reference allele, A: alternative allele). Record all the positions in the output file. If there is an indel at one position, FamSeq will write the same line in input vcf file to output vcf file. The number of positions in input vcf file and output vcf file are the same. If option -v is set, option -a will be discarded. If neither ‘v’ or ‘a’ is set, FamSeq will record all the positions except the indel positions. The name of input vcf file. All the individuals must be in one vcf file. Output file name. If FamSeq calls a variant at a position, it will add two tags (FGT:genotype called by FamSeq and FPP: posterior probability estimated by FamSeq) at column FORMAT in vcf file. A likelihood ratio cutoff. If likelihood (most likely genotype)/sum(likelihood of all genotypes) is less than the cutoff, we use pedigree information to improve variant calling. The default value is 1, we call all variant using pedigree information. Set it to 0 to only use single individual based method. Any values in between will determine whether FamSeq or single method is used for variant calling at a position. Genotype probability of three kinds of genotype for autosome in population (Pr(G)) when this position is not in dbSNP. The default values are: 0.9985, 0.001 and 0.0005. The dbSNP position should be provided in column ‘ID’ in input vcf file. Genotype probability of three kinds of genotype for autosome in population (Pr(G)) when the position is in dbSNP. The default values are: 0.45, 0.1 and 0.45. Genotype probability of two kinds of genotype for chromosome X for male in population (Pr(G)) when the variant is not in dbSNP. The default values are: 0.999 and 0.001. Genotype probability of two kinds of genotype for chromosome X for male in population (Pr(G)) when the variant is in dbSNP. The default values are: 0.5 and 0.5. Number of burn in when the user chooses the MCMC method. The default value is 1,000n, where n is the number of individuals in the pedigree. Number of iteration times when the user chooses MCMC method. The default value is 20,000n. The likelihood type. There are four types of likelihood: Normal (n), log10 scaled (log10), ln scaled (ln) and phred scaled (PS). The figure shown above is type n, without any scale. All other options are similar as in command vcf. FamSeq creates a new file by adding three columns to the original input file as the output file: GPP, FPP and FGT. GPP is the posterior probability calculated by single individual based method and FPP is the posterior probability calculated by FamSeq. These probabilities are all Phred-scaled. FGT is the genotype called by FamSeq.